It's not that far-fetched to consider the existence of alternate realities. People regularly sketch them out in their minds; they contemplate what would've happened if they had lived in a different city or taken another job, and what might've come of asking that guy or girl in a coffee shop for their phone number. This idea sprouts a root structure of secondary curiosities, like whether they'd be a smoker in another setting or if their taste in music would've been the same. Krzysztof Kieslowski's The Double Life of Veronique (La Double vie de Véronique) not only acknowledges this idea of slightly-tweaked existences, but also perceptively -- and with a painterly, figurative eye -- outlines how a unique girl differs between two versions of the same life, shaped by her surroundings and decisions. But dropping them both in the same reality, and giving then a mysterious awareness of one another, changes this focus into something ethereal and introspective. The Double Life of Veronique follows these two women born the same day whom suffer the same ailments, both played by Irène Jacob. It starts in Poland, where Weronika pursues a career as a virtuoso classical singer. She's vibrant and capricious, the kind of girl who'll sing in bucketing rainfall and feel nothing but joy, and she's also the type who won't ignore an unclear emotional pull to discover why she doesn't feel "alone in the world". Then, the film transports to France, where Veronique lives a quieter and more reserved life; she also gravitates towards music, yet she teaches young children's orchestral classes instead of pursuing a performing career. She's different in the way she wears her hair, carries herself, and even makes love, yet it's impossible not to see their deep-rooted similarities. She also feels an unexplained rush of emotion, though it's made of a darker, more unsettling fabric than Weronika's -- and only we know why. Watching the dissimilarities and parallels between Weronika and Veronique becomes a mesmerizing experience that inspects the nature of identity, provoking our impulse to interpret the obscurity surrounding their search for answers. Kieslowski focuses on behavioral ticks, showing the similarities and differences between the women while a splendid Irène Jacob cradles necessary nuance in every move she makes. We spend a lot of time analyzing the gradient of her personas' facial mannerisms, from the glee one exudes during her rainfall serenade to the solemn curiosity that wafts over another as she watches a marionette performance. She's captivating, in every sense of the word. Her capacity to essentially create three different characters -- the core of Weronika/Veronique, and the individual components that make each of the two unique -- never lets our attention wander, unless Kieslowski intentionally wants it to. He does, occasionally, but only with intent. The yellowish-green haze that cinematographer Slawomir Idziak paints over The Double Life of Veronique gives it an otherworldly, meditative feel, which lulls those watching into a dream-like state. 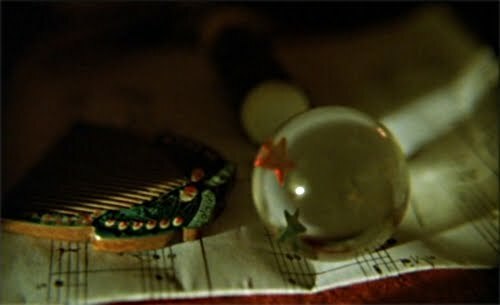 As shots linger on Kieslowski's doppelgangers, the director intercuts visuals meant to both obfuscate and guide our thoughts, such as shots of a glass ball rendering an upside-down image of a town passing before Weronika's eyes. Though the beauty seen within becomes enough of a reason to glance through the ball with her, it also triggers thoughts of glimpsing into an opposite version of her world, tying back to the film's musings. Instead of explaining their dual existence purely through words, he communicates their connection -- and, in tandem, their emotional isolation -- through lyrical eye-candy that, even without a deeper meaning, can leave one entranced at its beauty. Perhaps the pinnacle of its thoughtful presence comes in an almost Hamlet-like "play within a play": the marionette show, right at the heart of the film's transitioning focus. It's a stunning sequence; with familiar green tones draped over an audience of children, and with that familiar music once again streaming through the air, an accomplished puppeteer reenacts the life of one of the doppelgangers in the presence of another, in the form of a ballerina. She's unaware, and in fact she becomes more interested in the person actually pulling the strings than the production he's putting on -- which is a shame, since he's answering many of the profound questions that trouble her. This sequence pulls together everything Kieslowski wants to communicate to its audience, yet he does so in a delicate way that's void of self-gratifying imagery, and it radiates a haunting sort of beauty because of that freedom. Kieslowski's choice to create an ambiguous link between these coexisting doppelgangers allows existential examination to propel The Double Life of Veronique, vaguely yet poignantly mining the ideas of kindred spirits and our control (or lack thereof) over individuality. That link Weronika and Veronique share, both the country-crossing flutters of emotion and their mutual drive towards music, offers a glimpse into the power of a deeper connection between human beings that reflects on predestination, while transforming into something of an emotional Rubik's Cube. 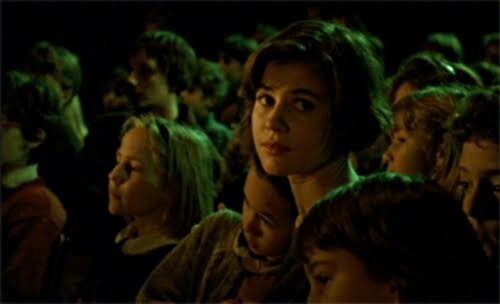 Each churning of emotion that changes their lives -- from the dreams they share to their connected instances of unexplainable joy or depression -- reveals more of the enigma scattered across this deeply-felt story, yet Kieslowski's filmmaking here isn't about solving a riddle, nor does it demand finite answers to its inquiries of circumstance or correlation. Instead, The Double Life of Veronique allows the soulful movement of its mystery to sweep our minds into blissful contemplation. When Kieslowski repurposes motifs throughout the film, it's not just so that the audience can make heads or tails of a defined mystery. The elements folded within the plot -- looking through glass balls, the recurring musical interlude, and the play-within-a-play -- all carry an emotional weight that takes them beyond mere clues leading to an end. They're reflections, artifacts tying to a deeper level of spellbound meditation on its purposes, doubling as guides towards comprehension and remnants of each doppelganger's existence. But the answers to what they signify matter little in the grander scheme; Kieslowski's more concerned with leaving an impression and stirring up feeling in these separate lives, replacing a need to overtly explain why they exist. They could be twins, doppelgangers, live in alternate realities or even embody metaphorical representations of their countries of origin, and it wouldn't change the emotive weight embedded in its spellbinding nature. An accurate and intelligent review. It makes a refreshing change from the more usual western meta-physical, meta-rubbish commentaries I have to endure reading! Thank you for writing it. I have added it to my favourites. Glad you enjoyed the piece, Alexandre!